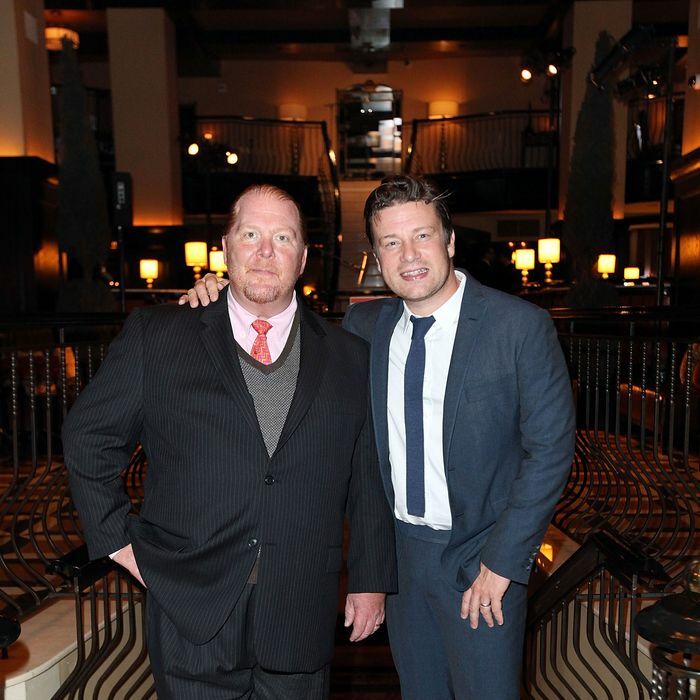 Last night, Mario Batali hosted his second annual MB Honors dinner at Del Posto to benefit the Mario Batali Foundation. Batali, and attendee Jamie Oliver, mingled with the A-list crowd (VIP tables went for $15,000; standard tickets started at $1,500), but Grub caught up to them to talk about Babbo’s newly regained Michelin star and why, despite an old report to the contrary, Jamie Oliver still isn’t quite ready to open a restaurant in this country. Mario, Michelin just came out with the ratings, and your restaurants were bumped up. So what are you doing differently? Mario Batali: Sometimes the guides help you, and sometimes they hinder you. You don’t want to create an experience for the guide. If the book is relevant, it’s interesting to see what people think about your restaurant. You want to build a restaurant that has happy cooks, happy servers, and happy customers. If they recognize us, that’s great. Babbo had a star, lost it, and now it’s back. We’re always trying to make it better, and sometimes you need someone to say, “I didn’t love what you loved.” We’re very proud to be involved in any book like that. Jamie, any thoughts to expand your restaurants to the U.S.? Jamie Oliver: I was just talking to Mario about it. As cocky as I am in the U.K., I’m just a little bit frightened in the U.S.
MB: So, it’s off your radar, or it’s still percolating? JO: It’s always been there. When you have multiple restaurants with years and years of building relationships … and this place [looks around at Del Posto] is a testament to that … there’s a whole team behind all of that, and I just haven’t had the right partner. I’ve just held it off and off and off. JO: How and when and at what price? I think it’s still in the mix. I’d love to do it one day. Maybe I’ll grow some balls and sort it out!